I’ve tried different ways to attach the top and the back to the ribs. The first few I used kerfed linings. Then I tried solid linings. 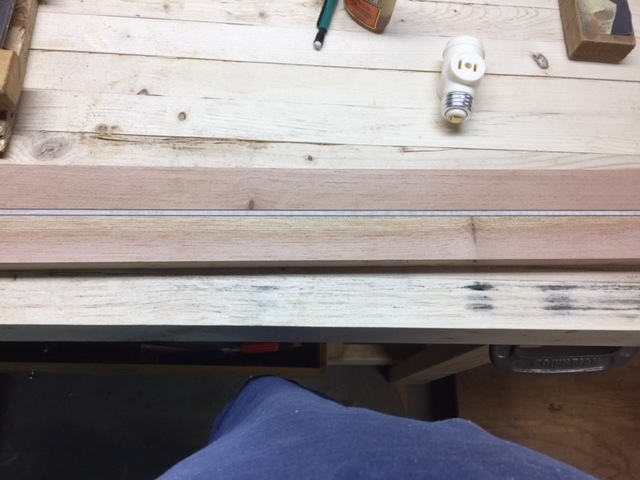 One day, on a whim, while standing next to my table saw, router table, and a stack of 30″ strips of Spanish cedar, I fabricated a few dozen linings with the kerf reversed. My last few guitars utilized these linings, and I was pleased with the result. Though making those linings with the reversed kerf was kinda tedious. When I run out of the current batch, I may consider buying them pre-made. 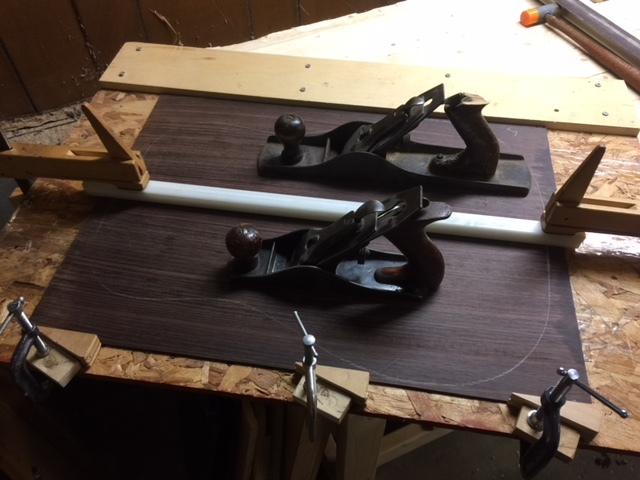 Although I have a LOT of 30″ Spanish cedar strips on hand…. 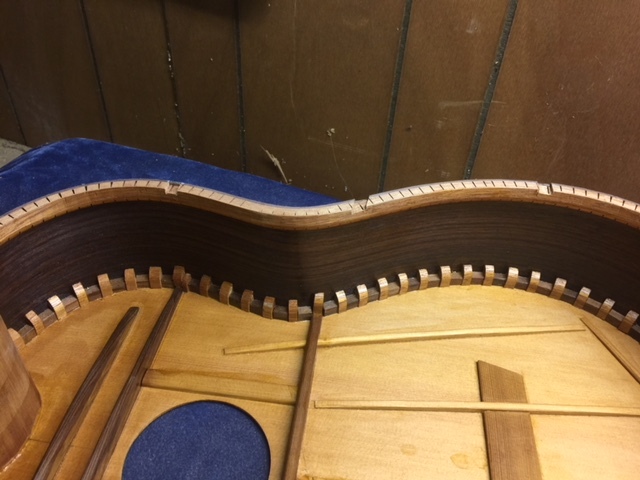 On my current batch, I used the reversed kerf linings for the back, but on yet another whim, I decided to go old school and use the traditional Spanish method of tentallones for the top. On the one hand, it was tedious. On the other, there was no rush to fit and clamp the top perfectly before the glue set. Tedious just became leisurely. Simply clamp the sides to the top and glue the tentallones in place at a nice and easy pace. And it looks kinda cool, although the end user will not see it unless he or she puts an inspection mirror inside. I laminate my neck blanks. The neck blank is 1st ripped down the middle a table saw, and one half is flipped in relation to the other. I then take a flatsawn strip of hardwood and sandwich it in the middle of the 2 halves. In times past, the hardwood strip was ebony or rosewood; in this instance I had some flatsawn maple on hand that suits the overall aesthetic of my current batch, so it gets the nod. When the 3 pieces are glued together, the resulting end grain looks something like this: ///////III\\\\\\\ . I’ve been doing it this way for some time now, and the necks have stayed straight. ……sometimes, mother nature all on her own can provide one with the best mechanics and aesthetic. Other times, she can kick one right in the groin. In this case, a couple of ugly knots appeared in this neck blank after a half a mm thicknessing. Bracing patterns. They’re kinda like opinions and as…..errr…..rectums: everybody has one. 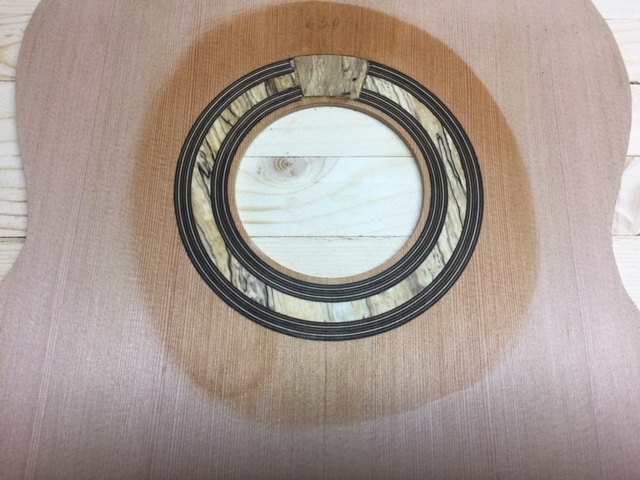 To add even yet another variable to the mix, many players approach the purchase of their next instrument with a preconceived notion that a particular bracing pattern will yield a particular set of results. I was once on the consumer side, so I once was just as guilty of this. Flashback to a time @23 years ago, when I visited a guitar dealer with a very large selection of guitars by many luthiers past and present. There were 2 guitars by >insert.name.of.a.world.renowned.luthier<. One guitar was braced in a very traditional fashion, while the other had very radical and “modern” bracing. This >insert.name.of.a.world.renowned.luthier< had recently told a publication the reasons for his radical and modern innovations. In this interview, he used all of the buzz words associated with modern lutherie at that time: “Louder”, “better projection”, “separation of voices”, “increased sustain”, etc. 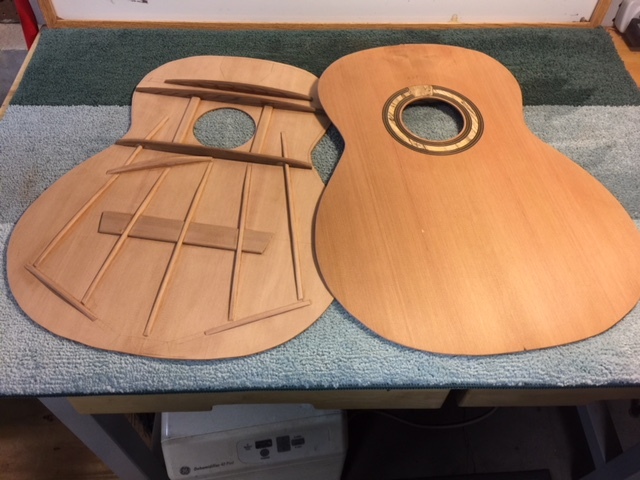 After playing a few dozen guitars, those preconceived notions were still in my head a bit when I got to those 2 guitars built by >insert.name.of.a.world.renowned.luthier<. So imagine my surprise when the modern braced guitar built by >insert.name.of.a.world.renowned.luthier< was rather quiet, dull, lifeless, and overall very uninspiring, while the traditionally braced guitar built by >insert.name.of.a.world.renowned.luthier< had a beautiful voice, impressive volume, and a projection that seemed to permeate every corner of the room. 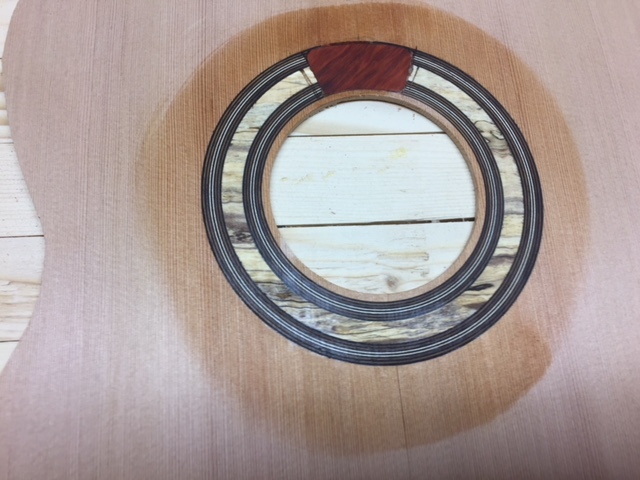 1) the bracing pattern in and of itself is just one variable among countless other variables that contribute to the tonal outcome of any given guitar, and..
2) the bracing pattern is unique to the individual builder, and the countless other variables also unique to that individual builder and to the mechanical properties of the tonewoods involved WILL contribute to the final tonal outcome. When I was a student and a consumer back in the 80’s, there were basically 2 modern builders at that time whose guitars were in steady use among touring concert performers. 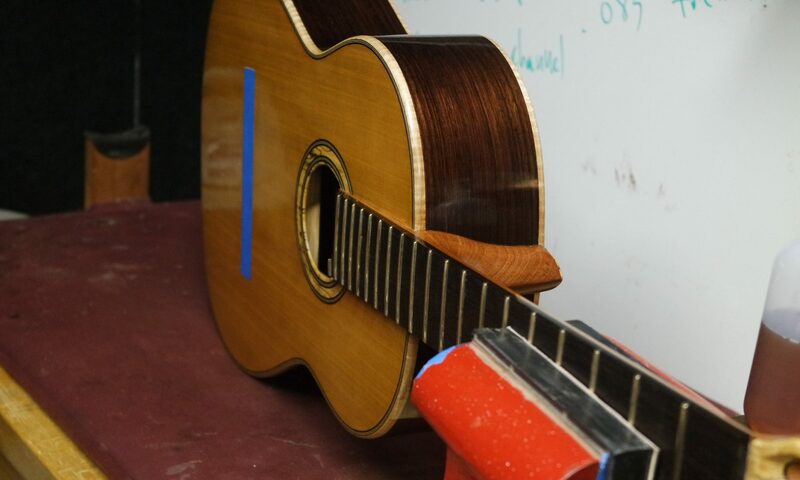 One of them believed that in order to achieve even the smallest improvement, a luthier must make radical changes . The other firmly believed and practiced keeping the changes and variables from one guitar to the next to an absolute minimum, so that in the final tonal outcome, desirable changes could be noted and less desirable changes could easily be bactracked. My respect for those 2 builders is immense, but in this aspect, I tend to agree with the latter. 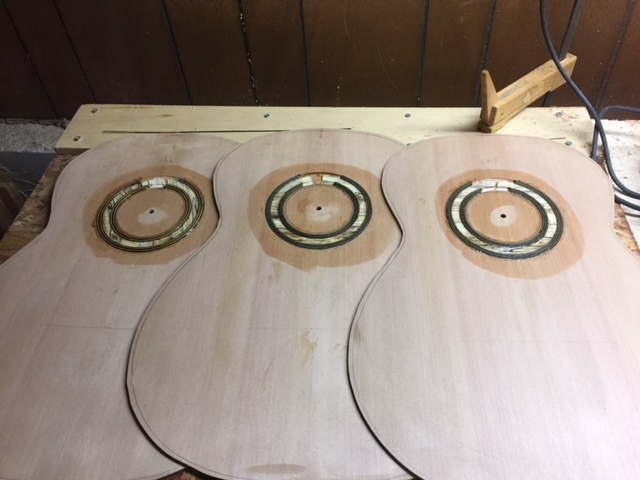 That said, the Bull Run Experiment continues, with all 3 tops thicknessed and graduated to the same dimensions, and braced as identically as I humanly could brace them, with the overall weight of each top currently within 2 grams of each other. 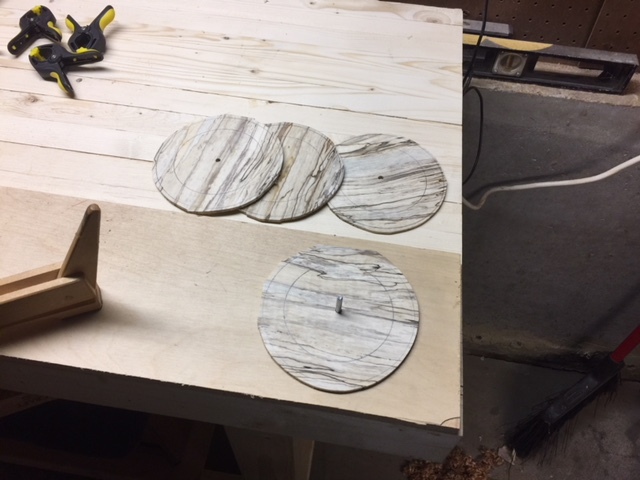 I will get the weight exact from top to top before I attach them to their respective boxes, and then only one variable will be allowed on each. 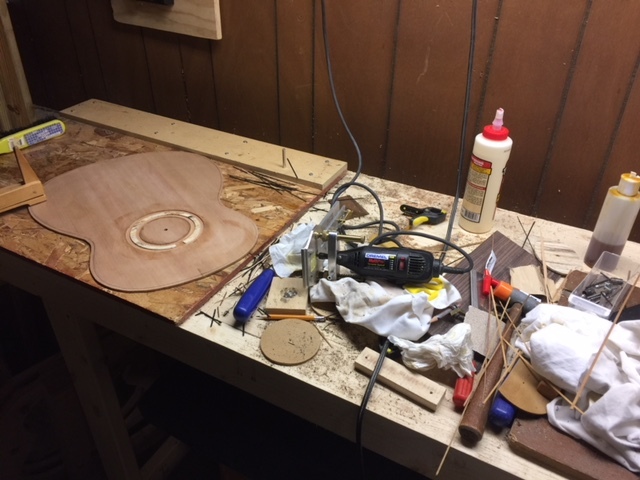 So….after a few years of laying off of building guitars, with the exception of a “one-off” a while back, I’m back at it. A couple of years ago, I bought a billet of western red cedar from the Bull Run Watershed. Legend has it that this is a federally protected forest NW of Portland, Oregon that experienced a flood some years back. As a result of this flood, many trees naturally fell, and loggers were permitted to go in and recover the fallen trees. Some of those loggers were privy to luthier’s needs, and alerted legendary luthier Robert Ruck to the harvest. Bob then harvested his own needs and then some…..with the excess going to his long time friend Jerry Roberts. I bought a billet from Jerry. 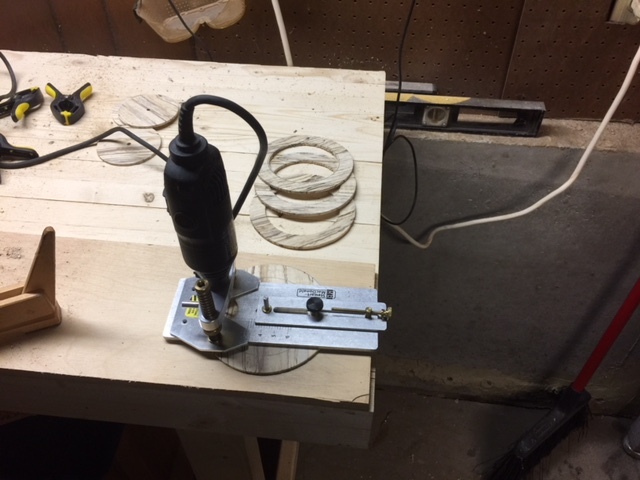 My dad “adapted” his bandsaw to resaw the billet, and after a bit of a learning curve in brutal Missouri summer heat, we were able to yield 4 tops from the billet, with plenty of bracing stock left over. So the next 3 guitars are going to come from that billet. 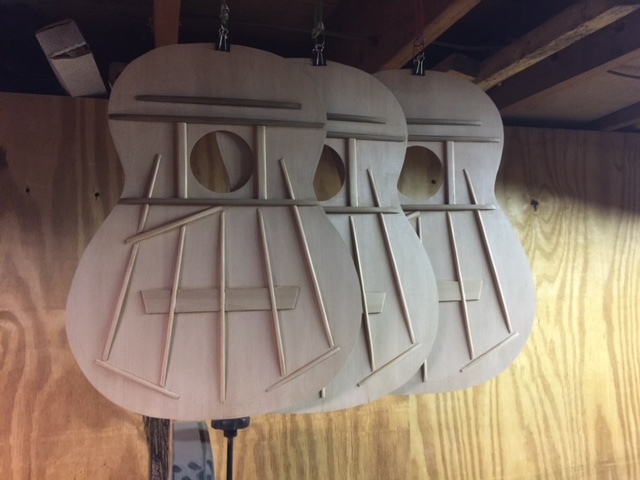 I see it as the perfect opportunity to execute a proper experiment, where one and only one variable will be executed on each of the 3 guitars. 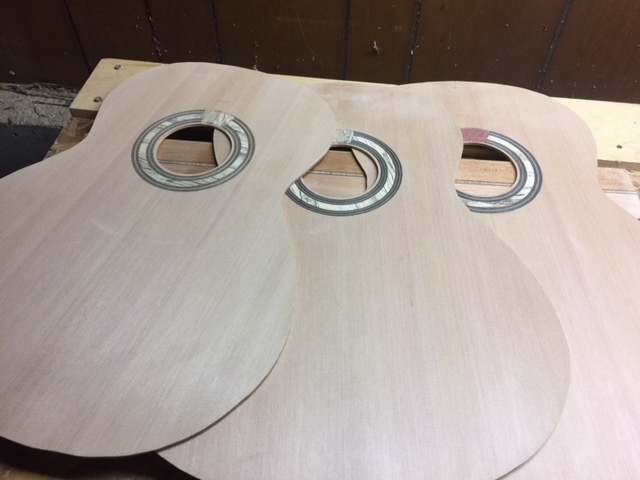 All 3 tops, bridges, and necks will come from the same boards and will have the same mechanical properties. 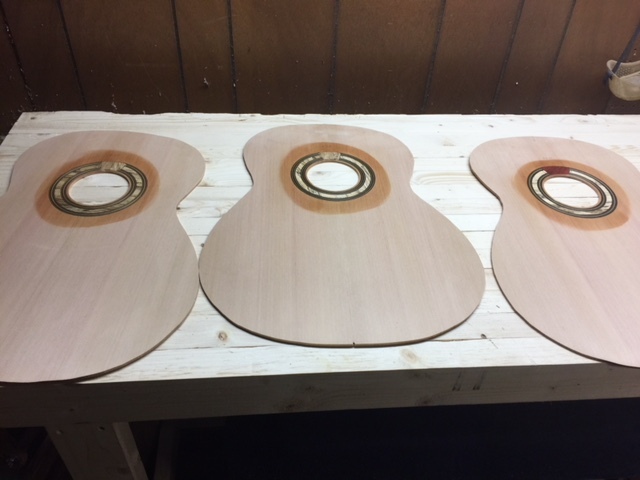 All 3 will have East Indian Rosewood for the back and sides, which is much more consistent in weight and stiffness than all of the other rosewood species. 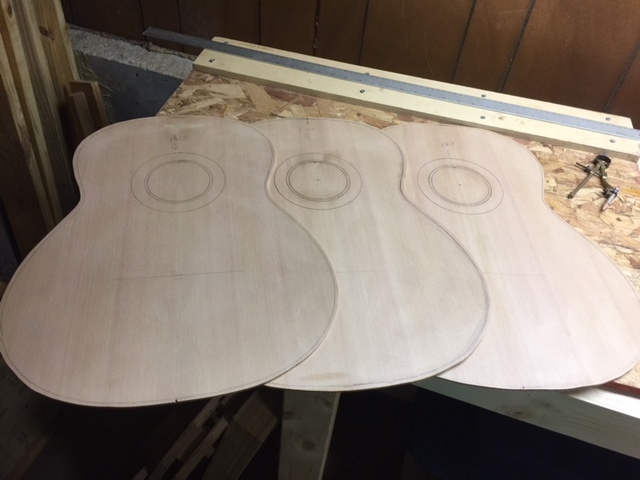 Prior to now, I have built guitars one at a time, but this time, every single operation, I do consecutively in 3’s. Guitar #1 will be built to my current specs. 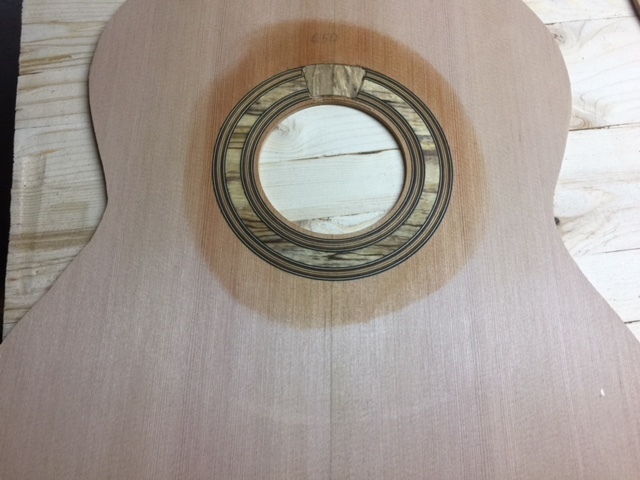 Guitar #2 will have an additional 3mm added to the neck elevation. Everything else will remain the same. 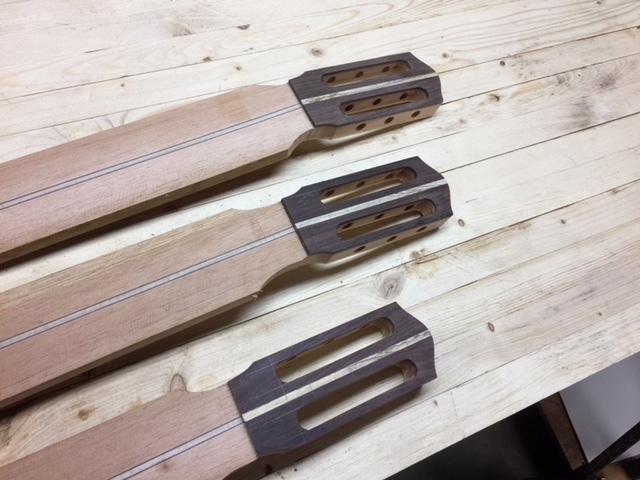 When neck elevation is added, the neck pitch has to be accounted for in order to keep the string height at the bridge the same. I’ve been in online “debates” with other builders as to the ultimate effect of neck angle on tone; here is the perfect opportunity to see if neck angle truly affects tone. 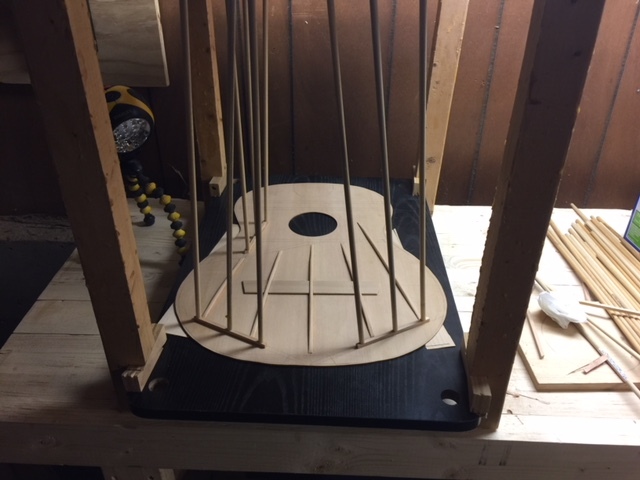 Guitar #3 will be scaled longer at 660mm. When I was in college during the mid 80’s, 650’s were the rage and one could not give away a 660 scaled guitar. Since then, I’ve had a few custom orders for 660 scales, and in each instance, I felt like the finished product yielded just a little bit more of everything; rounded highs, balanced mids, full basses, increased headroom, etc. But since those guitars were “one-offs”, I really had no way of knowing if the increased scale had anything to do with the perceived improvements. Now I will. So here we go. Stay tuned.